Regional anesthesia is increasing in its utility in the treatment of injuries, foreign body removal, and even in the operative setting. By providing a regional block, the affected anatomy can be properly cleaned, explored, and treated without causing unnecessary pain to the patient. In many settings, regional anesthetic is also preferred because it prevents the distortion of the anatomy commonly seen in local anesthesia. Regional anesthesia of the ankle presents a challenge to the provider because of the complicated nerve supply to the foot and the varied locations of the nerves around the ankle. However, by adequately anesthetizing the foot, patients can be offered relief from often painful injuries while the complex anatomy of the foot is examined and repaired. See Ankle Joint Anatomy for more information. 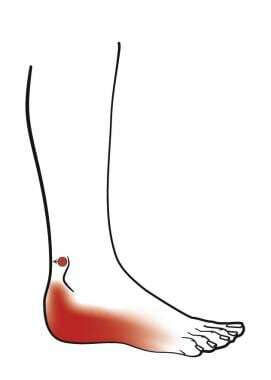 An image depicting a cross-section of the ankle can be seen below. The most commonly used short-acting subcutaneous anesthetic agent is Lidocaine, which can be given as 1% or 2% mixtures. Epinephrine 1:1000 may be added to both 1% and 2% solutions. Epinephrine is typically added to local anesthetic to cause vasoconstriction, prolonging the activity of the anesthetic and limiting bleeding. The time between injection and onset of anesthesia with lidocaine is approximately 60-90 seconds, and the effects of lidocaine typically last 20-30 minutes (up to 2 hours if mixed with epinephrine). The maximum dose of lidocaine in adults is 300 mg (3-4 mg/kg in children), when mixed with epinephrine, the maximum dose is 500 mg (7 mg/kg). Bupivacaine 0.25% or 0.5% (Marcaine, Sensorcaine) is a common long-acting anesthetic agent. The time of onset of these long-acting agents is approximately 10-20 minutes, but the anesthetic effects last 4-6 hours alone, and up to 8 hours when mixed with epinephrine. The maximum dose of bupivacaine is 175 mg (2 mg/kg) in an adult, but this is increased to 225 mg (3 mg/kg) when mixed with epinephrine. 50/50 or 25/75 mixtures of lidocaine and bupivacaine may provide the most optimal anesthetic for certain ankle anesthesia, providing nearly immediate relief from pain from the short-acting component, and providing up to 8 hours of anesthesia from the long-acting medication. Because regional anesthesia is administered some distance away from the wound site, and also because epinephrine should be used with great caution in distal extremities, anesthetic medications mixed with vasoconstrictors such as epinephrine are not recommended in ankle anesthesia. All injections should be performed under sterile conditions, with the area of injection cleaned with iodine or chlorhexidine. The size of the syringe varies depending on the amount of anesthetic given (keep in mind maximum doses), but all injections should be given with the smallest needle possible in an effort to cause the least pain. A 25-gauge needle is small enough to provide little trauma to the skin and is an excellent choice for administration of anesthesia. 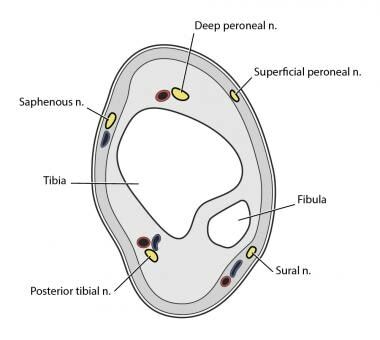 The superficial peroneal nerve provides sensation to most of the dorsum of the foot and the dorsal aspect of each of the toes and web spaces, with the exception of the lateral portion of the great toe and the medial side of the second toe, and corresponding web space. 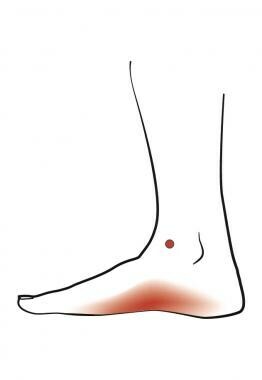 The nerve passes subcutaneously on the anterolateral side of the ankle. As with the administration of any anesthetic, care must be taken to draw back on the syringe before injecting medication to prevent intravascular administration. The deep peroneal nerve provides sensation to the lateral portion of the great toe and medial side of the second digit, as well as the web space between the 2. 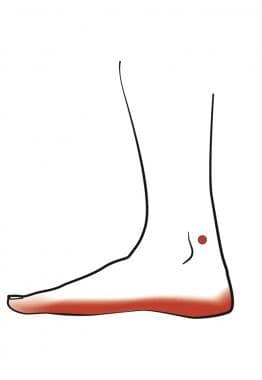 This distribution is commonly referred to as the “flip-flop” nerve because it innervates the area surrounding the thong of a sandal. This nerve runs deeper in the ankle than the superficial peroneal nerve, hidden behind the extensor hallucis longus tendon. The saphenous nerve provides sensation to the skin on the medial aspect of the foot along the arch and runs alongside the saphenous vein between the medial malleolus and the anterior tibial tendon. The posterior tibial nerve is the largest in the ankle and branches into the medial and lateral plantar nerves in the foot, supplying sensation to the entire volar surface, as well as providing motor innervation to the intrinsic muscles of the foot. It runs deep to the posterior tibial artery. The sural nerve supplies sensation to the lateral and medial aspects of the foot. It passes between the lateral malleolus and the achilles tendon. Anesthesia of the posterior tibia nerve may cause loss of sympathetic tone to the vascular supply of the foot resulting in vasodilation. The effect of this vasodilation is increased warmth in the foot and may also result in an increase in blood loss to an injury on the volar aspect of the foot. Advise patients to pay special attention and care to the anesthetized foot while the affected limb is numb. Avoid re-injecting nerves once anesthesia medication is administered. Very few contraindications to local or regional anesthesia of the ankle exist. Injection of local anesthetic should never be performed through infected tissue. Spektor M, Kelly J. Regional Anesthesia of the Thorax and Extremities. Roberts, Hedges. Clinical Procedures in Emergency Medicine. 5th. Philadelphia, PA: Saunders Elsevier; 2010. Volume 1: Chapter 30, 528-530. Ankle Block, Regional Anesthesia. NYSORA: New York School of Regional Anesthesia. Available at http://www.nysora.com/peripheral_nerve_blocks/classic_block_tecniques/3035-ankle_block.html. Accessed: 5/28/11. Hadzic A, Vloka JD, Kuroda MM, Koorn R, Birnbach DJ. The practice of peripheral nerve blocks in the United States: a national survey [p2e comments]. Reg Anesth Pain Med. 1998 May-June. 23(3):241-6. [Medline]. McGee D. Local and Topical Anesthesia. Roberts, Hedges. Clinical Procedures in Emergency Medicine. 5th. Philadelphia, PA: Saunders Elsevier; 2010. Volume 1: Chapter 29, 481-499. Reilley TE, Gerhardt MA. Anesthesia for foot and ankle surgery. Clin Podiatr Med Surg. 2002 Jan. 19(1):125-47, vii. [Medline]. Reilley TE, Terebuh VD, Gerhardt MA. Regional anesthesia techniques for the lower extremity. Foot Ankle Clin. 2004 Jun. 9(2):349-72. [Medline].